Happy Monday friends. What a great weekend we have as we are less than 6 weeks until we close on our new home! Ahh! Each week new and more fun things are being added to our amazing dream space and I can't wait to share full details soon! Truly bringing the kids each week and seeing their amazement and the process of seeing a hole in the ground and now a home we'll be living in is so much fun. They truly marvel at everything that's been added ( well, except Landon because he's 16 months old ha ). I was able to actually have some quality time with Lily, something I've neglected the last few months since moving back to Chicago, and it was truly needed for both of us. 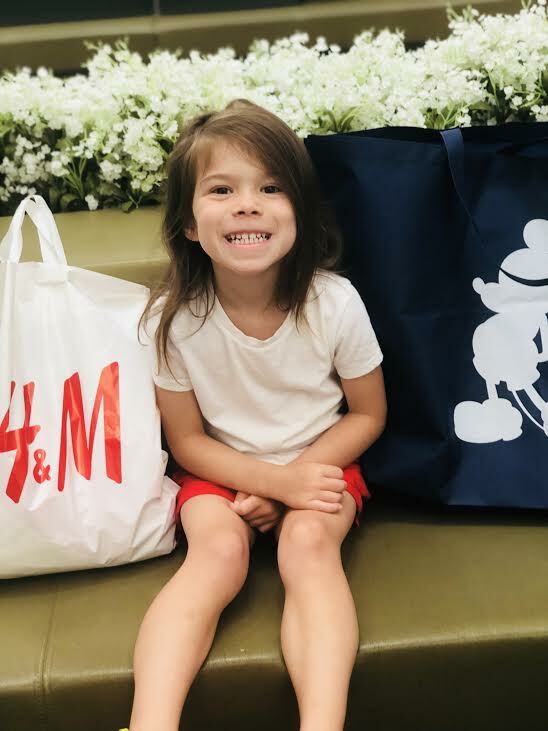 We were able to spend our time shopping at a mall for back to school clothes, eat ice cream and just spend quality time together that we haven't had. Lily loved the attention, trying on new outfits for the fall and just being such a fun spunky little thing that she is. During our time together, Lily had spilled some ice cream on her outfit and her immediate reaction was tears and saying she was " so sorry!" I immediately felt awful and told it was ok, dabbing it with napkins and assuring that all was fine. And then it came to me...how many times had I scolded her for getting something on her outfit? How many times had I wanted her to look the perfect part? That's not why we're born. We're born to be real; not perfect. This mantra came to me when I had this moment with Lily but in all aspects of how our days out now. Social Media depicts us all to try and be perfect. We want the perfect hair, the gorgeous house, our nails always polished, our friends to follow us to gain popularity. Sometimes I hit a moment where I'm not living the life I want to be living. For me, for my family or my children. I want to live a real life; one that is full of hard times, difficult moments but uplifting and exciting ones. And I'm real by sharing all of that with you on my stories on social media and these blog posts for you to view. The truth is, you can control your social media account but not your reality. We are real people behind our posts, with real issues going on. Our lives aren't perfect and we only post what we want you to see and know. Don't get caught up in viewing or admiring other's life. Even the most success ones have their doubts and personal struggles. 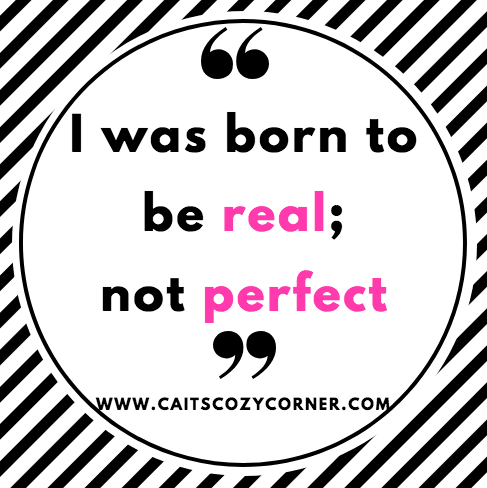 So say it with me friends; you were born to be REAL; not perfect. I needed that this morning! Thank you love! Media can be such a blessing but can rob us of joy if we let it. This post was a great reminder! Real not perfect...oh boy...if anybody needed to read this today, it's certainly me. As a child, I wasn't really permitted to mess up -- even just a little bit! And I've carried that into adulthood with me, which isn't really fun or healthy. I rarely cut myself some slack and will brood over it for days if something wasn't done just perfectly. It reminds me of that saying 'progress, not perfection'. Now, when I can actually achieve that, I'll be a much healthier, well rounded person. Congrats on your new abode! How exciting that you get to close on your home soon!! Also, love the messaging in this post <3 thanks for sharing! Definitely needed to hear this today! Such an important lesson to be reminded of. It's funny how we realize these things with our kids but sometimes are so hard on ourselves. As a struggling perfectionist it can be hard to let go of the need to always be in control and have everything perfect, but life just isn't perfect no matter how hard you try. Thanks for sharing. Also, so exciting about your house!! Yesss girl, preach! This is such an important thing I hope all women learn sooner rather than later. Real is much better than picture perfect. Thank you for sharing your heart! Closing on your home has to be exciting for you guys. Also loving the message behind the post here!